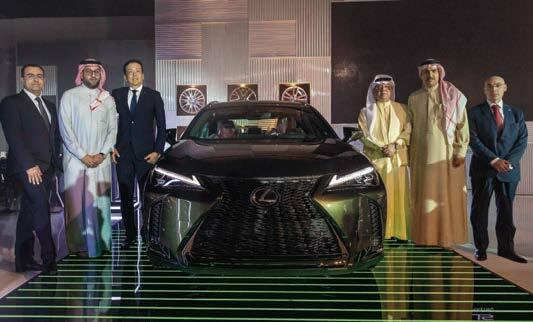 Ebrahim K. Kanoo, the sole distributor of Lexus vehicles in the Kingdom of Bahrain, launched the all-new Lexus UX, innovative addition to the Luxury Compact Crossover segment. The all-new model combines the latest luxury offerings and safety means in a package which includes new charismatic design elements and ultraefficient powertrains. While the UX name is derived from the guiding concept of the vehicle’s design team and describes the vehicle’s mission as Urban + X-over (crossover), the model delivers a quick and engaging driving experience with a Lexus-smooth demeanour, making it a unique entry in the crossover segment. The lightweight yet super-rigid structure has a refined suspension tuning and provides the UX with exemplary handling and ride comfort, along with a distinctive driving personality. Powered by a new high-efficiency 2.0 litre, four-cylinder engine, which is coupled with a new 10-speed Direct Shift Continuously Variable Transmission (DCVT), it offers a host of exciting features including a Direct Select Controller. The exquisite interior provides a range of advanced features that offer a refined cabin experience. It includes 10.25-inch multimedia display, 10.2 inch coloured and adjustable head-up display, 7-inch multi-information display, wireless charging system, analogue clock with GPS correction function. The car features a comprehensive array of safety features which includes Pre-Collision System (PCS) with pedestrian detection during daylight and certain low-light conditions, as well as daytime cyclist detection, all-speed range Dynamic Radar Cruise Control (DRCC), Lane Departure Alert (LDA) with Lane Tracing Assist (LTA), and adaptive high beam system (AHS). The model is available in 13 distinctive exterior colours.